Dolphins, Sharks and Manatees, oh my! 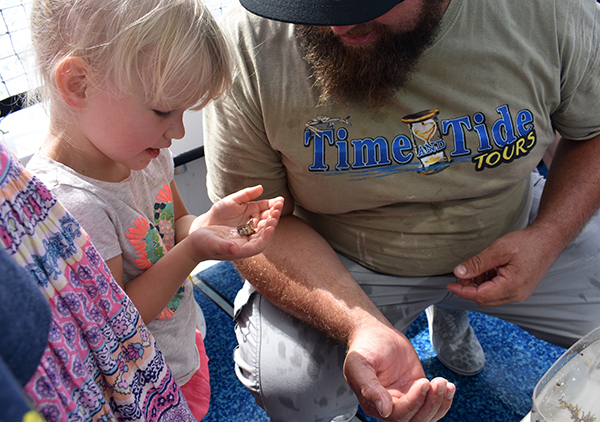 We joined the Time and Tide Tours in Port Canaveral prior to our sailing on the Disney Fantasy and it was an awesome way to learn about the port and the history of the area. 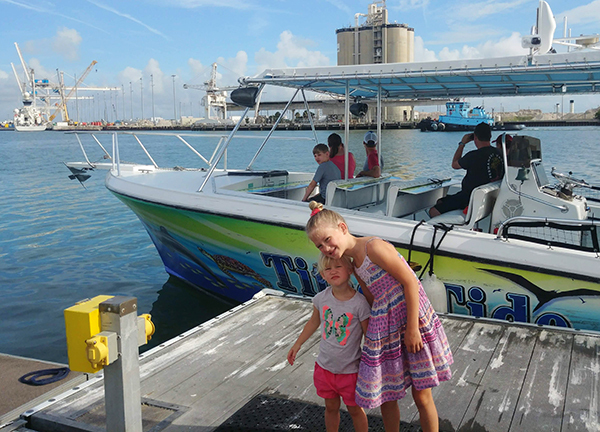 We got to go fishing, see and hold aquatic wildlife, and watch a pod of dolphins swim in the wake of our boat! 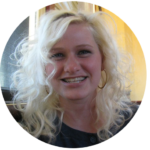 We found out about Time and Tide Tours by joining a Facebook group for our cruise sailing. A family booked this tour prior to the sailing and paid for three extra children to ensure the boat would be full enough and not cancel. To join, all we had to pay for was Gabriel and myself! (Just so you know we also covered the tip for both families as a gesture of gratitude to the other family.) Facebook groups are a great way to meet up with like families prior to the cruise, to cut costs on excursions by joining other groups, join fish extender groups, learn tips and tricks and more! 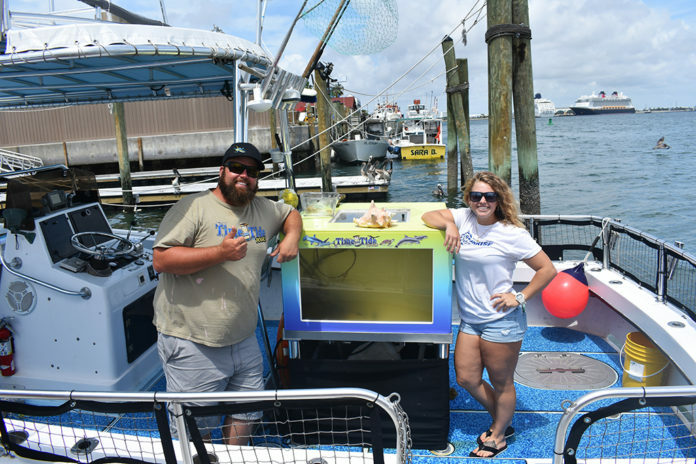 The tour started with a bit of a history lesson as we left the shore and ventured out to the open ocean with our Captain Dustin and our tour guide Holly. We passed through the channel and learned how Port Canaveral is now the largest cruise port in the United States! The water is actually quite shallow, just 44 feet deep and the ships must be guided in through man made dredged canals. During our cruise with Time and Tide Tours we passed by NASA headquarters, launch pads, submarines, barge vessels, and government restricted beaches as we searched for wildlife. To help with the history lessons and spotting local sites of interest we were each given a bingo card to assist with asking questions and spotting everything. While we found the tour of the coastline and surrounding areas quite fascinating we didn’t end up spotting much wildlife other than birds and a few fins that would rather have remained underwater. The kids were totally bored, and Eclair tried to fall asleep. We did see a manatee on the way back that surfaced for just a brief moment. 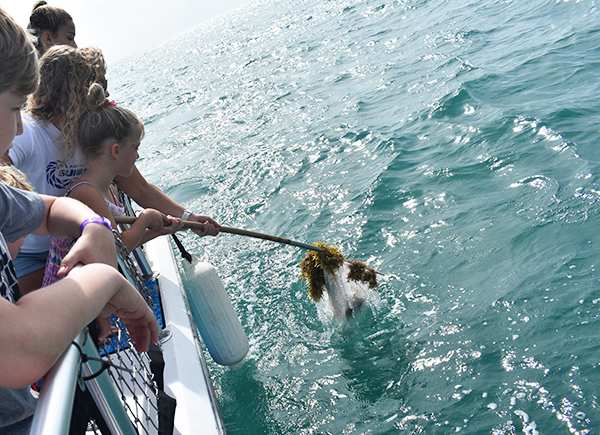 Once we got deep enough, the captain and tour guide pulled out a net to grab seaweed from the ocean. At first, I didn’t quite see the allure of this, but they gave each of the children a turn at grabbing seaweed out of the ocean. 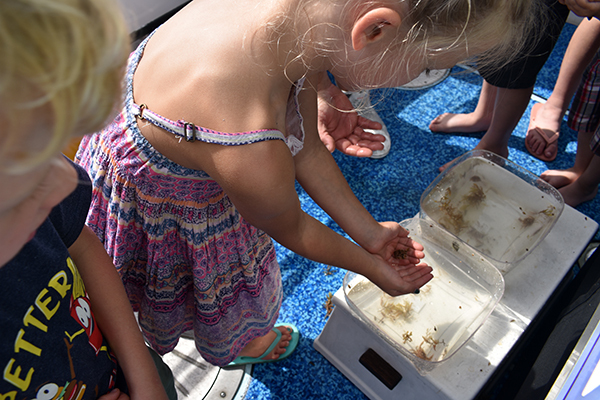 After each child had a turn, the captain sifted through the seaweed to find all the little animals hidden inside. 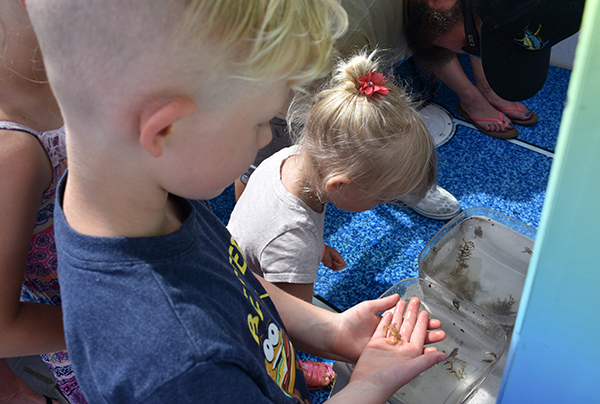 We found tiny fish, crabs, and shrimp. He put them in a smaller container that the children could watch, touch, feel and hold. 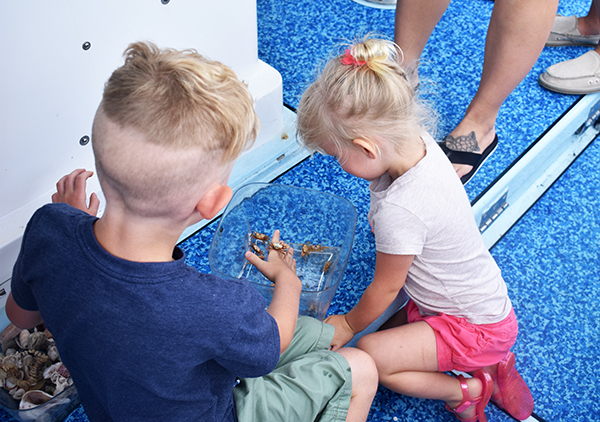 Dusty explained all the characteristics of each aquatic animal and let each child have a chance to hold the creatures. Our little Eclair suddenly perked right up. 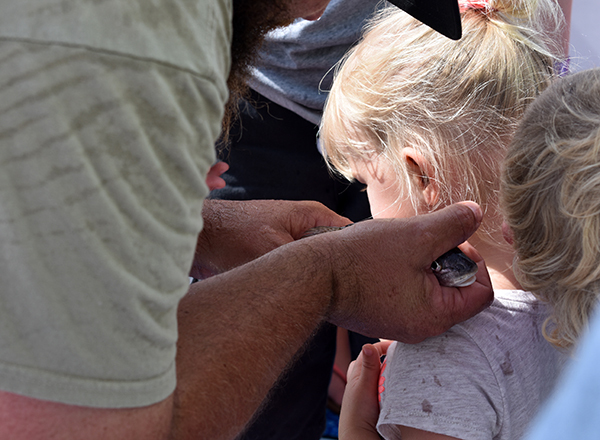 She couldn’t get enough of these amazing little creatures and how they felt in her hands. This was definitely her favorite part of Tide and Time Tours. The captain was unbelievably patient with each of the kids, their grabby hands, excited squeals and impatient tottering. He took his time with each one. He answered all their questions. He let them hold the animals, and inspect each one until they were satisfied. 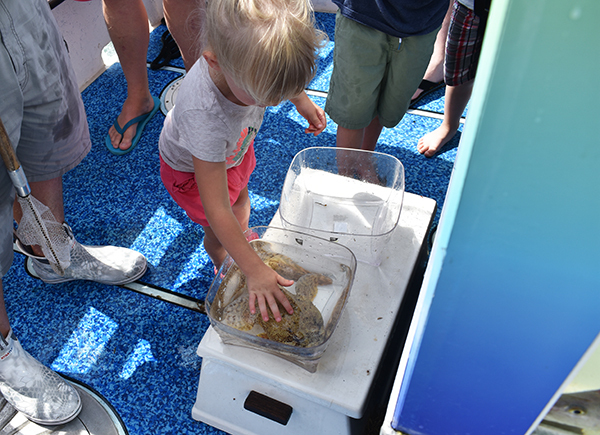 A larger fish tank is also onboard the Time and Tide Tours boat and after the children had a turn at the smaller creatures they each individually pulled from the ocean, they learned about the larger species of fish. 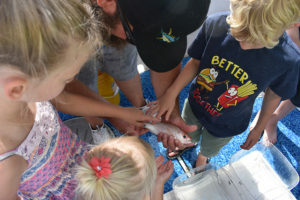 Just as with the smaller creatures, Dusty pulled them each out of the aquarium and explained the features and characteristics of each fish one by one. He even held them up so the children could hear them breathe. We finished the Time and Tide Tours by going through the opposite end of the coast, through the Banana River. In order to keep the shoreline consistent for the cruises we had to enter a channel lock and wait for clearance. Cant. Stop. Touching. The. Fish. On the other side we found pods of dolphins leisurely enjoying the afternoon sun, including a mama and her baby! The captain maneuvered his way around them in order to allow them to swim in our wake and we were able to watch them for several minutes. They swam around us in circles, showing off even. It was an amazing site to see them in their natural habitat interacting with us humans who were in awe of them. 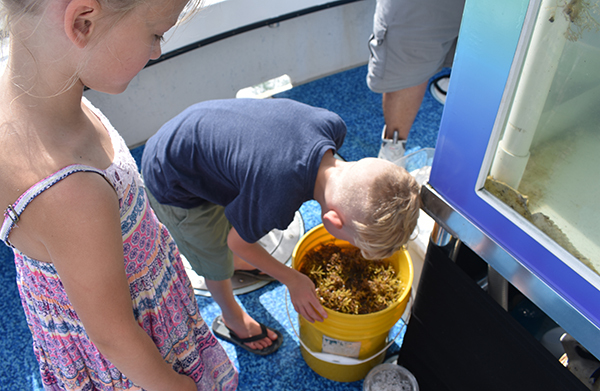 ► For Kids: This was such a treat for all the children onboard as they got to reel in the seaweed and see what they caught in the process. 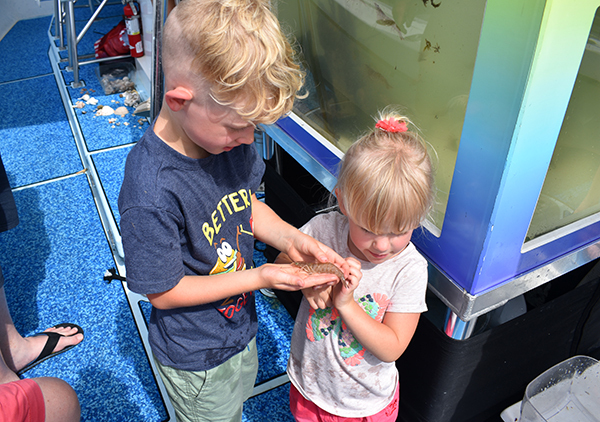 Time and Tide Tours were experts in teaching them about the different features of each aquatic swimmer and patient enough to let them touch, feel, hold, and examine each one. They finished the tour with an adventure book for each child to take home with facts and information about the ocean and wildlife. Have you ever taken an Eco Tour or Fishing Excursion? We’d love to hear about it! This was our first, but definitely not our last! 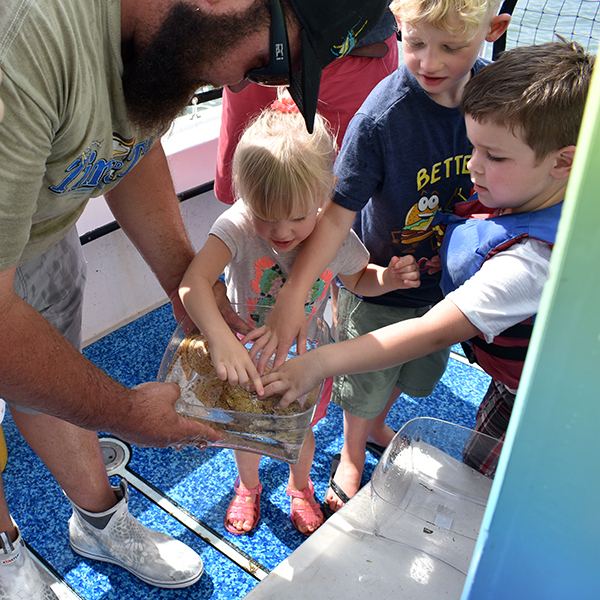 ► Nap-Time Version: Our Family Eco Tour with Tide and Time Tours on the Atlantic Ocean and Banana River watching pods of dolphins in the wild and catching tiny crabs, shrimp and fish. We finished the afternoon with lunch at Seafood Atlantic at Dusty’s recommendation directly over the water (coming soon), and check out all our adventures on our magical cruise aboard the Disney Fantasy!